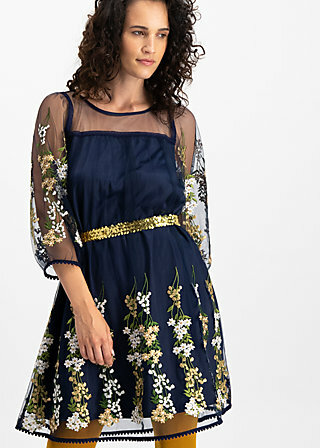 br>The sleeves and the wide-swinging skirt part of this A-line dress are decorated with embroidered flowers in matching colours. A playful pompom border embellishes the hemline and completes the exquisite masterpiece, making it even more a big and very unique favourite. A snug lining made of supple and softly flowing satin guarantees amazing wearing comfort, countless feel-good moments and free movement. A 'crème de la crème' detail: When you add this dress to your wardrobe, you'll also get a shimmering sequinned belt – aside from being an absolute highlight, this waist belt also gives you a feminine silhouette in a blink of an eye. Glamour(d)rama Yeah!